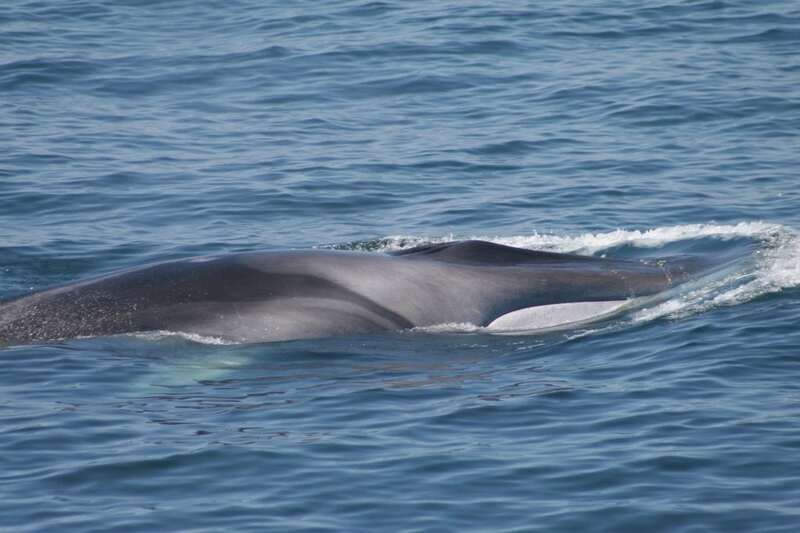 Whalers in Iceland hunt endangered fin whales as well as to minke whales. While the fin whale meat is exported to Japan, most of the minke whale meat is served to tourists. In 1982, the International Whaling Commission (IWC) agreed to stop all commercial whaling by 1986. Unlike other whaling nations, Iceland did not take out an ‘objection’, but once the ban was in place, continued a small “scientific whaling” programme, hunting a few dozen whales each year until 1989. It left the IWC, abruptly, in 1992. Iceland rejoined in 2002, this time taking out a ‘reservation’ against the ban and resumed commercial whaling in October 2006, awarding itself a commercial quota for fin and minke whales. This move was furiously disputed by many countries - including the UK - angry at what they regarded as Icelandʼs attempt to bypass international regulations. Between 2006 and 2015, a total of 706 fin whales were killed. This statistic is all the more tragic, given that the fin whale is the second largest animal on the planet. Each whale is special in its own right of course, but a creature this size also plays a crucial role in maintaining the health of the marine ecosystem. As if this was not enough, the fin whale is listed as ‘endangered’ by the IUCN (International Union for the Conservation of Nature). In 2015 and 2016, no find whales were hunted after the whalers fell out with Japan over its meat testing methods. However, in April 2018, we learned that Iceland’s sole fin whaling company, Hvalur hf, planned to resume the hunt in June, and they have been as good as their word, bringing the first fin whale bodies in on June 22nd. This was incredibly disappointing news, as we had hoped that Hvalur hf CEO, Kristjan Loftsson, at the age of 74 - and given the many difficulties offloading his fin whale meat in recent years - would choose to give up whaling for good. But there was worse news to come: this year’s quota, issued by the Icelandic Fisheries Minister, allows as many as 191 fin whales to be killed. The final kill tally could even reach 239 if the whalers decide to exploit a second quota of 48 fin whales, in a new hunting zone to the east of Iceland. Icelandic whalers have slaughtered more than 1,700 whales (fin, minke and sei whales) since the global ban on commercial whaling came into force in 1986. Demand for whale meat is declining globally, forcing whalers to dream up ever more desperate uses for whale products, including dog treats, iron supplements and even a so-called flavouring for beer! “Whilst most of Europe basks in a heatwave, I stand shivering on a remote hillside above the whaling station at Hvalfjörður, an hour’s drive north-east of Reykjavik. This is a starkly beautiful landscape. The fjord is framed by dark hills and fulmars are cackling and wheeling low over the water. All this contrasts vividly with the pitiful spectacle unfolding only metres away. A hundred metres offshore, the Hvalur 8 is moored; its grim work done. At first, slight turbulence in the water is the only sign something is happening, but quickly the all-but submerged body of a fin whale is revealed, hauled inexorably towards the landing stage. As the carcass continues its obscene progress up the slipway, it is clear that this is a small whale - a male and, at around 12 metres, only a juvenile at that. Fully winched, I can see the gaping entry wounds from the harpoon. There is a flurry of activity. The crew work with efficiency and precision, hacking off the little whale’s fluke and within minutes, stripping back its skin, as if peeling a grotesque banana. The blubber beneath is bridal white. Who eats fin whale meat? In short, a decreasing number of people, mainly in Japan - but quite a few dogs! Yes that’s right: Icelanders themselves eat virtually no fin whale meat so Hvalur exports almost all its fin whale products to Japan. Isn’t it illegal to ship meat from endangered whales halfway across the globe? No. The shocking truth is that Iceland and Japan have taken out ‘reservations’ against the listing of fin whales under Appendix 1 of the Convention on International Trade in Endangered Species (CITES) and can legally trade this endangered species with each other. Iceland is the largest exporter of whale meat: Japan the largest importer. Since 2006, Hvalur has exported well over 10,000 tonnes of fin whale products to Japan. WDC has consistently condemned the escalating trade in whale meat, which undermines CITES. 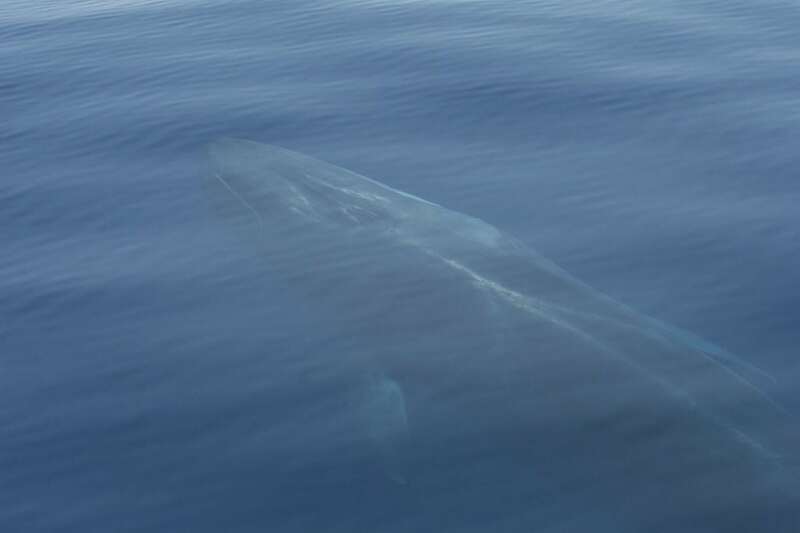 Recent analysis by the United Nations Environment Programme’s World Conservation Monitoring Centre specifically highlighted trade in meat from fin whale (as well as minke whale) as an issue of concern. These exports have taken place regardless of declining demand from Japanese consumers. Despite slashing prices - and offering Icelandic whale products via Japanese internet stores including sites owned by Google, Yahoo and Amazon - sales of imported fin whale meat have been consistently poor, at times leading to huge frozen stockpiles. Sluggish sales have also forced suppliers to cast around for alternative ways to offload their unwanted whale meat. Until June 2013: Hvalur hf, Iceland's fin whaling company shipped its catch to Japan via EU ports, including Southampton, Rotterdam, Le Havre and Ham However, massive protests that year by WDC and others forced a shipment to be returned to Iceland and since then, the company has been obliged to cast around for alternative routes. February 2014: 12 shipping containers of fin whale meat arrived in port at Halifax and transited Canada by train ‘under bond’ before departing from Vancouver for Japan. 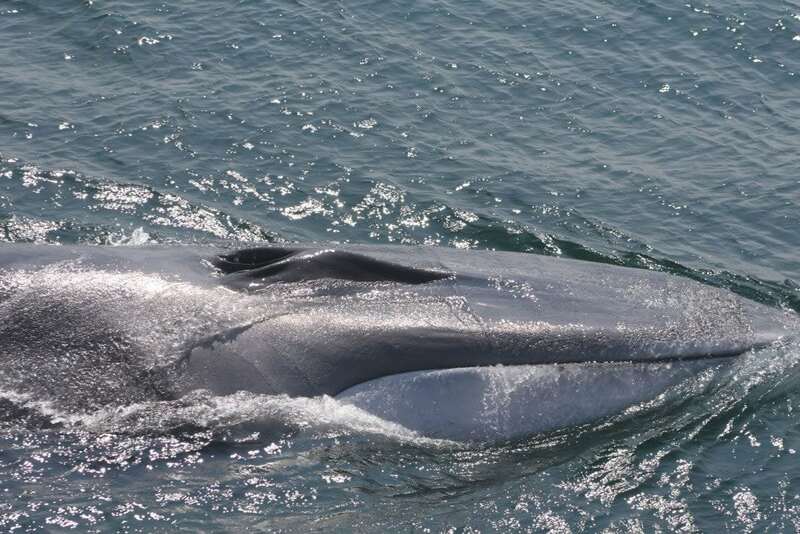 March 2014: 2,071 tonnes of frozen Icelandic fin whale meat travelled aboard the container vessel Alma round the coast of Africa, reaching Japan in early May. 2015: The container vessel Winter Bay carried 1,816 tonnes of frozen fin whale meat through the Northeast Passage, reaching Japan on 1st September that year. July 2016: The Winter Bay carried 1,529 tonnes of frozen fin whale meat from the 2015 season the same route, arriving at Osaka on 9th September. August 2017: The Winter Bay carried around 2,000 tonnes of frozen fin whale meat (again from the 2015 season) the same route, arriving in Japan at the end of that month. Fin whale dog treats ! For many years, surplus whale meat from Japan’s domestic hunts has been offloaded in pet food, but in May 2013, WDC and other NGOs exposed the sale of Icelandic fin whale ‘jerky’ dog treats in Asia, including via Rakuten and other massive Japanese e-commerce websites. One Japanese company, Michinoku Farms, marketed the meat as a ‘low calorie, low fat, high protein snack’ targeting affluent pet owners. Our campaign quickly persuaded Michinoku Farms to drop the product. Whale beer : Since January 2014, Iceland’s Stedji brewery has produced an annual ‘whale beer’ launched to coincide with the midwinter festival of Thorrablot. Despite the fact that most drinkers gave previous whale beers a definite ‘thumbs down’ on taste grounds, the brewery doggedly persists in its efforts to convince tourists that they really DO want to drink a beer brewed with sheep dung-smoked fin whale testicles. Bio-fuel: In February 2013, fin whaler Kristjan Loftsson boasted that he was rendering down fin whales and using their oil as a ’bio fuel’ (an 80% diesel / 20% whale oil mix) to power his whaling vessels. Iron supplements: Bizarrely - and surely indicating desperation - in 2018, Hvalur announced that it is ‘considering the possibilities’ of using dried whale meat extract in iron supplements for people suffering from anaemia. The company claims to be collaborating with researchers at the Iceland Innovation Centre and the University of Iceland and is also reportedly considering the use of gelatine, extracted from whale bones in a range of other “foods and medicines”. Hvalur cites this new marketing direction as justification for resuming the hunt of endangered fin whales for commercial purposes but it is also likely to be a move dictated by recent difficulties in exporting fin whale products to Japan. Seafood linked to fin whaling? No thank you! WDC and other NGOs ran a successful campaign to expose the strong links between fin whaling and Icelandic seafood giant, HB Grandi. Until early May 2018, Hvalur boss, Kristjan Loftsson, was chair of the HB Grandi board and Grandi has previously allowed the whalers to process fin whales at their premises. Our campaign resonated with consumers, with surveys showing that over 90% would avoid purchasing seafood linked with whaling. We also received huge support from major household names, including Tesco, Waitrose and Asda, which audited their supply chains to ensure that they weren’t purchasing from HB Grandi. Our investigations showed that much of the Grandi fish exported to the UK is sold by fish and chip shops and we were delighted to receive support from an industry which sells a staggering £1.2 billion worth of fish and chips annually! The announcement that fin whaling will resume in 2018 seems to have made the link with whaling too much of a ‘’hot potato’ for Grandi’s marketing department to stomach and Hvalur-linked companies will now transfer their Grandi shares to Brim, another large Icelandic seafood company. You can be sure that we will be keeping a close eye on proceedings! “It’s a warm June day and I’m taking a whale watch tour out of Rekjavik with some WDC colleagues. We meet a pod of 10-12 white-beaked dolphins and linger a while. Next moment, two minke whales surface near our boat! We spend ten minutes indulging in some apparently mutual curiosity, before moving on. We spot a telltale blow on the horizon and enjoy the spectacle of a local humpback nick-named Picasso diving and surfacing around our boat. As we reluctantly head for shore, two more minkes appear and then, as if biding us farewell, a dancing group of dolphins lightens our journey back to port. After being treated to an ocean alive with whales and dolphins, it saddens and surprises me that some of our fellow watchers disembark and head straight for a harbourside restaurant whose pavement board boasts cured minke whale with horseradish and blueberries. Minke whale hunts in Icelandic waters did not start into well into the 20th century. Unlike Norway, where whalers typically kill hundreds of minke whales each year, the number of minke whales killed this century peaked at 206 in 2009, but has otherwise been 60 or fewer. The current (self-allocated) quota for minke whales is 217, but unlike Iceland’s fin whaling, the minke whale tally has always been far below quota and the number of companies and vessels operating has declined steadily in recent years. In 2017, Iceland’s minke whaling company, IP-Utgerd Ltd., killed a total of 17 minke whales, the lowest for a decade. Company CEO, Gunnar Bergmann Jonsson, blamed this decline on a number of factors, including difficulty locating whales to harpoon. 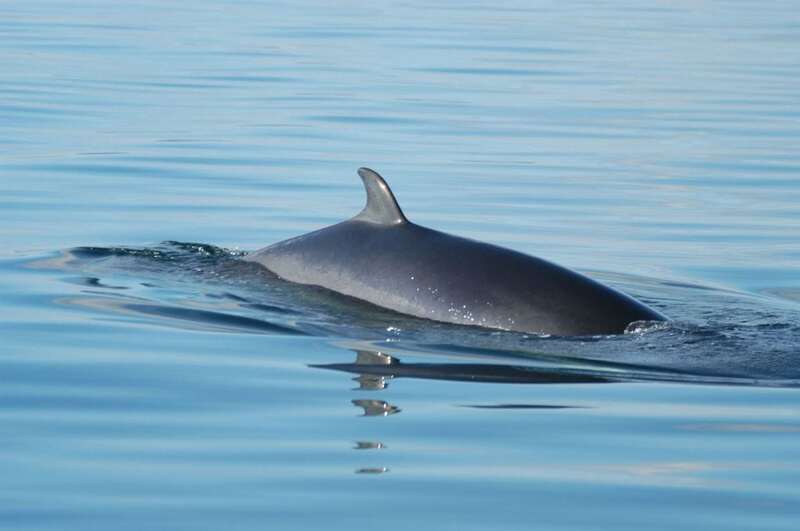 Indicators to date suggest that minke whale numbers in the region have been steadily declining over the past decade or so, with the reasons behind this decline still poorly understood. Significantly, even scientists at HAFRO, Iceland’s pro-whaling Marine Research Institute, admit that they don’t know enough about the abundance, home range and behaviour of minke whale stocks in Icelandic waters: casting grave doubt on the Icelandic government’s often repeated claim that their whaling is ‘sustainable’. When whaling resumed in Iceland in 2003, minke whale meat sold poorly. The Icelandic government has gone to great lengths to develop new products and encourage the public to try whale meat; however, their efforts have largely been unsuccessful and the consumption of minke whale meat by local people has declined steadily year on year. A 2016 Gallup poll found that 81 percent of Icelanders said they had not bought whale meat at all over the previous 12 months. Only 1.5 percent said they had bought the meat "six times or more often”. Tourists are getting the message! Most of the minke whale meat is consumed by tourists, under the mistaken belief that it is a ‘traditional’ dish. However, a major public awareness campaign by WDC and other NGOs has been very successful in driving down tourist demand. A survey conducted in 2009 for IFAW (International Fund for Animal Welfare) found that 40% of tourists surveyed admitted to sampling whale meat in Iceland. By 2015, this figure had fallen to 18% and by 2016, had dropped still further to 12%. Given that a record 2.2 million tourists visited Iceland in 2017, it is incredibly important to reach tourists with the message that whale meat is neither traditional nor a popular dish locally. Shockingly, as with fin whales, Iceland can legally import (or export) minke whale meat with Norway under their respective ‘reservations’ to CITES regulations, which are respected by the vast majority of other countries. In 2002, Iceland imported 25 tonnes of minke whale meat and blubber from a Norwegian whaling company under this ‘reservation’. The meat initially sold well, especially as it undercut the price of beef and other meat on sale. However, the following year, it was discovered that the Norwegian whale meat contained much higher levels of mercury than the minke whales hunted in Icelandic waters. As a result, the Icelandic Surgeon Generalʼs office issued a warning to pregnant and nursing mothers to restrict their intake of whale meat. The Faroe Islands has no CITES legislation in place, and regularly imports whale meat from Iceland and Norway. In 2006, 2008 and 2010, shipments of Icelandic minke whale meat with a total weight of almost 100 tonnes were exported to the Faroe Islands. In 2010, 25 kilos of minke whale meat were also shipped to Latvia, in violation of CITES and European Union laws. Help us end whaling in Iceland for good! At times, the battle to end whaling can seem interminable and the obstacles overwhelming. But we have already had many successes in this campaign and with your support, we will fight on until whales in Icelandic waters are safe and free. We helped coordinate huge protests against the transit of fin whale meat through EU ports, including Rotterdam and Hamburg. In 2013, an Avaaz petition with a million signatures helped see a shipment returned to Iceland. We were delighted when the two shipping companies involved, Evergreen Line and Samskip, swore off carrying whale meat again. Tourist outreach campaigns have seen the percentage of tourists sampling whale meat fall from 40% in 2009 to 12% in 2016. We persuaded retailers - including the giant Findus Group - to put HB Grandi fish on their blacklist due to close links with fin whaling. We exposed the sale of fin whale ‘jerky’ dog treats in Asia and persuaded one supplier, Michinoku Farms, to abandon the product. A 2018 MMR survey demonstrated that public support for whaling is plummeting. Only 34% of those surveyed support whaling - in 2013, that figure was 60%. And 34% now actively oppose whaling (compared to 18% in 2013). That still leaves just under a third currently neutral, so our challenge is to work with our friends and contacts within Iceland to reach the ‘undecideds’ and persuade them that supporting live whales and whale watching is best for Iceland as well as best of course, for the whales! We're also incredibly heartened by what appears to be a growing movement to challenge whaling at government level within Iceland. Iceland’s current coalition government is headed by a passionate environmentalist, Katrin Jakobsdottir, leader of the Left-Greens and widely regarded as one of the most popular and trusted politicians in Iceland. Since 2015, the Left Greens have an official policy of opposing whaling, and during her time in opposition, Katrin has tabled probing questions in parliament on whaling. A review into the future of whaling is due to be held in early 2019. Several MPs have called for the review to take into account the economic and social impact of whaling upon whale watching and other tourism sectors and also consider animal welfare concerns. Outside parliament, tourism representatives - weary of the negative publicity that whaling brings to Iceland’s door and aware of the grim reality that every whale harpooned is one fewer to be watched - are increasingly vocal on this issue. The Icelandic media is also critical - a recent article greeted Kristjan Loftsson's latest venture - to make iron supplements out of fin whale meat extract - with derision calling it a 'desperate pretext’. This is key. Change is always best when it comes from within and it is clear that Icelanders themselves are seriously questioning whaling. Both the fin and minke whalers have shown themselves to be out of step with the mood of the nation. The voices challenging whaling are ever louder - you can be sure that with your help, we will be supporting them every step of the way.